Bon Débarras unites the worlds of music, dance and poetry through a collaboration between Montréal artists Dominic Desrochers, Jean-François Dumas and now Véronique Plasse. 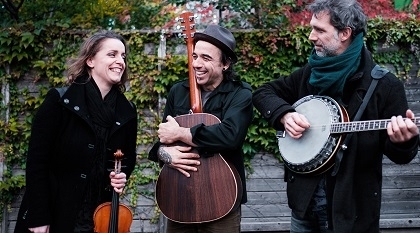 The group brings together a fusion of Québécois folk music, traditional step-dancing and global influences, for a show that is full of fun and inventive energy. On guitar, banjo, violin and harmonica, the trio opens a door to their recollections of America and their music is at the intersection of various traditions.